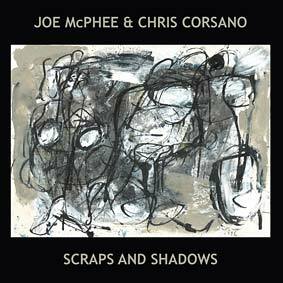 Listen : For Adrienne P.
Scraps And Shadows is the second album by the dream pairing of Joe McPhee and Chris Corsano. A followup toUnder A Double Moon, which featured McPhee’s alto saxophone, Scraps And Shadows finds him largely on tenor. Recorded live in Milwaukee in 2011, the album consists of seven dedicatory pieces, from the delicate balladry of “For Adrienne P” to the appropriately combustible “For Han Bennink.” Corsano’s stupendously detailed drumming and McPhee’s free-soul love cries weave a master latticework together. Cover art by Judith Lindbloom. Download coupon included. “Multi-instrumentalist Joe McPhee is 72 years old, far enough along that he could be forgiven for kicking back and letting people put laurels upon his brown. But as Fred Anderson, one of the seven dedicatees on this LP of dedications, was reminded every night that he walked off the stage of his club and went right back to stocking the bar, the free-jazz receiving line is a short one. McPhee knows this, too. Like Anderson, he’s carrying on as he always has, pushing himself to evolve and proving his mettle anew each time he plays. And he makes a special point of celebrating not just the people who’ve come before him, but the people who are making things happen now. Two of the people honored on Scraps and Shadows are no longer with us, but the other five still have earthly hands to receive the bouquets that McPhee and his much younger partner Chris Corsano have picked for them. But for these two men, paying tribute does not mean making nice; there are plenty of thorns in these bunches of flowers. Sticking mostly to tenor saxophone, McPhee pushes his horn beyond the bounds of convention; he sings through it, or along with it, obtaining otherworldly polytonal effects that’ll put the hairs right up on the back of your neck. He also plumbs his sax for vibrato-laden lines that arc out from whatever cloud the Ayler brothers smile down from these days and gnarled utterances so compacted it’ll take a dozen listens to decode them. He’s more frankly lyrical on his other instruments, using a patiently expressed pocket trumpet melody to set up a fractious tenor-drums duel on “For Paul Flaherty,” and honoring artist/musician/bartender Adrienne Pierlusi with a brief, tender clarinet air.